Jeron began studying viola at the age of ten in the strings program in Bend, Oregon. He chose to play the viola because he was told there would be fewer violists. After moving to the Sacramento Area, he played in the JMS Symphony, the Fairvale Orchestra and the Sacramento Youth Symphony. He feels that these early experiences were the foundation of his love for music. Following high school, Jeron went on to study Viola Performance at Ricks College, Brigham Young University and The University of Denver, studying with Kevin Call, David Dalton, Mikhail Boguslavsky and Basil Vendryes. Jeron has played professionally with the Colorado Springs Symphony and the Tacoma Symphony Orchestra. 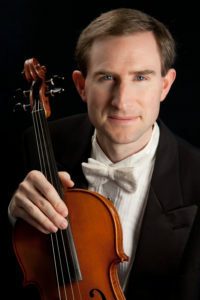 Shortly after returning to the Sacramento Area, Jeron joined conductor Michael Neumann and the Folsom Lake Symphony during their opening season, and began serving as principal violist shortly after. Aside from his love of music and his profession, drafting, Jeron enjoys gardening, bicycling, and spending time with his wife and children.